Why is Cooking with Coconut Oil Healthy? Worrying about cooking with coconut oil? Well, stop! It is healthy and here is why! A few years ago, because of bad information, Coconut Oil was considered to be a health detrimental food because of its alleged poor composition. Fortunately, it has been shown that not all fats are the same and that, in particular, while coconut oil is made up of 90% saturated fat, it is a source of medium chain triglycerides (MCT), known as the best source of fatty acids in addition to being rich in lauric acid, acid that gets to raise HDL levels, or good cholesterol in the blood. 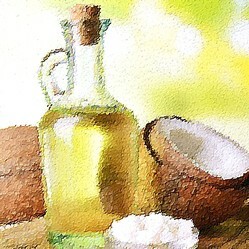 Coconut oil is very high in saturated fat, about 90% of its calories come from the saturated fat it contains. Saturated fat was unfairly blamed on bad for the body by a few influential scientists, however, new studies reveal that there is no link between saturated fats and heart disease. In fact, populations that eat a lot of coconuts are healthy. Coconut oil is different from most cooking oils and has a unique composition of fatty acids: lauric acid (predominant), myristic, steric, capric, caprylic, caproic, and palmitic acid. This makes the coconut oil to well support high temperatures and resistant to oxidation. For this reason, coconut oil is perfect for preparing fried foods. In addition, coconut oil is composed of a majority of medium-chain triglycerides. These fatty acids go directly from the digestive tract to the liver, where they become ketone bodies and provide a rapid source of energy. Coconut oil improves the blood lipid profile. Virgin coconut oil, increases HDL cholesterol (known as good cholesterol) and lowers LDL/HDL ratio [source] (a high ratio increases heart disease risks). It has also been shown to have favorable effects on blood clotting. In a study of women with abdominal obesity, coconut oil increased HDL cholesterol and reduced LDL/HDL ratio [source]. On the other hand, soybean oil increased LDL/HDL ratio and decreased HDL. Using virgin coconut oil can thus be a protector against heart disease. Not all foods and nutrients are metabolized in the same way. Some require time to be digested and metabolized and others, on the other hand, are absorbed and synthesized rapidly. What happens to coconut oil? Coconut oil has the quality of being thermogenic, that is, its intake increases the energy consumption (the burning of fats). And there are studies that confirm that taking one or two tablespoons of medium-chain triglyceride (MCT) per day, fats present in coconut oil, increases fat burning by 5%, a total of 120 calories per day. The calories of coconut oil are not like the calories of butter or olive oil, they are even more beneficial. Also, the MCTs are responsible for the appetite-reducing effect of coconut oil. Numerous studies have shown that MCTs sap the appetite much more than other fats, which automatically results in a lower caloric intake. As said above, coconut oil can be converted by the liver into ketone bodies. This supplies energy to the brain and is special for people suffering from epilepsy and other disorders. Coconut Oil can be your best ally of beauty, as it can be used topically with great results on the skin, improving hydration. In the hair, it provides a protecting and nourishing effect. It can even be used as a toothpaste or mouthwash, improving dental health and killing bacteria in the mouth. And best of all is that coconut oil will give an awesome flavor to your meals. Just be careful to buy virgin coconut oil and not refined coconut oil. Having lost weight, I am a little anxious about the approaching season and have been looking at ways not to regain it over seven days eating. A bit of research was needed. Easy to implement remedies to combat constipation and get soft stools. Fight constipation with foods that act as natural laxatives and with exercise which massages your colon.